When I mentioned to my friends I was going to Florence in February, many looked at me in horror and one friend also said “what? Tuscany in the winter? It does not sound right”. Think of Tuscany and you will immediately imagine sunshine, wine, good food and people walking around in shorts and t-shirts. I can confirm we had it all, but the latter. It was a special occasion, a surprise birthday treat for my husband Brian. He knew we were travelling somewhere in Europe and winter clothes would be necessary, but he did not know where. He only found out the destination on the way to the airport. The day we travelled it was a particularly cold day, -10 C at Gatwick airport and -3 C when we arrived in Florence. 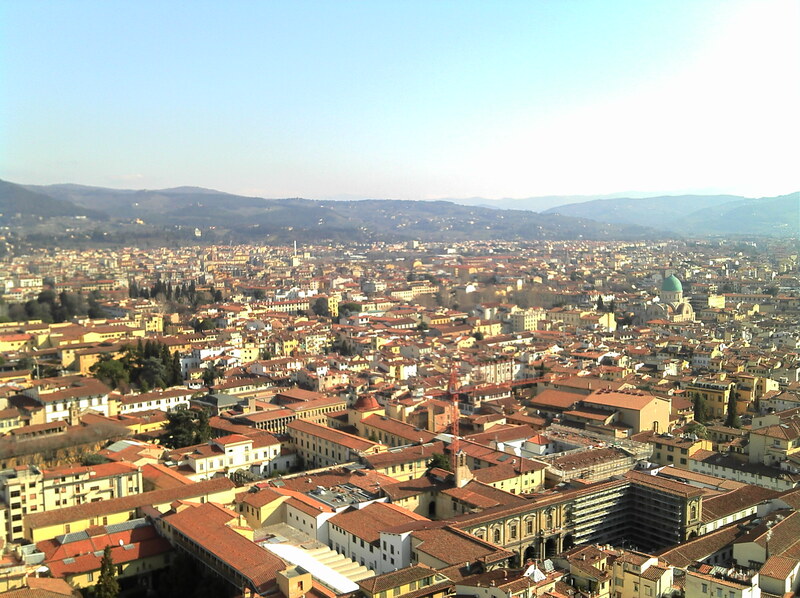 But the temperature in Florence did improve from the second day onwards to a balmy 10 degrees C.
We arrived at the Amerigo Vespucci Airport, 4 Km ( 2.5 miles) Northwest of Florence at around lunch time , it is a very small airport, so easy to find your way out. We travelled light and so decided to take the regular shuttle service into the centre, with SITA (or ATAF), the buses are every 30 minutes, located just outside “Arrival’s”. The journey takes about 20 minutes and costs only 4.50 euros. It was perfect for us. 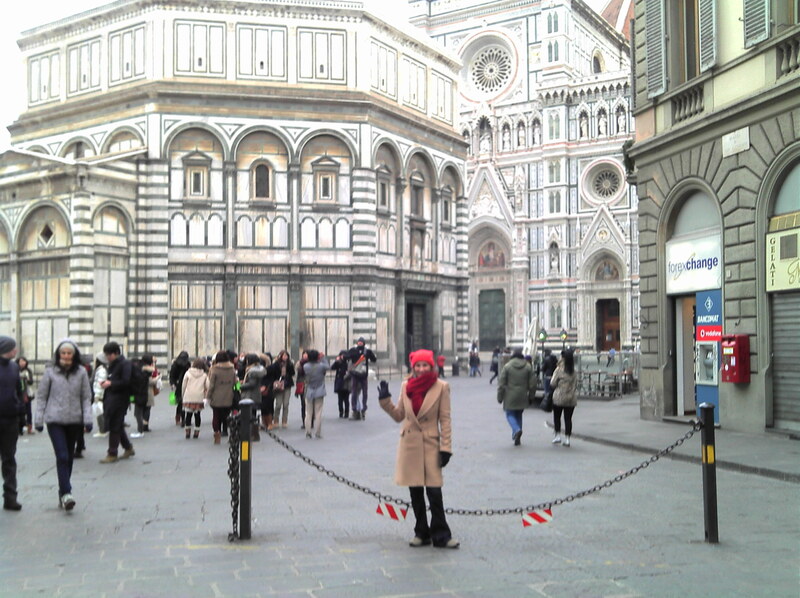 Florence is very compact and we were able to walk everywhere. We stayed at a lovely hotel (4 stars), by Ponte Vecchio and therefore we were within walking distance of all the main attractions. 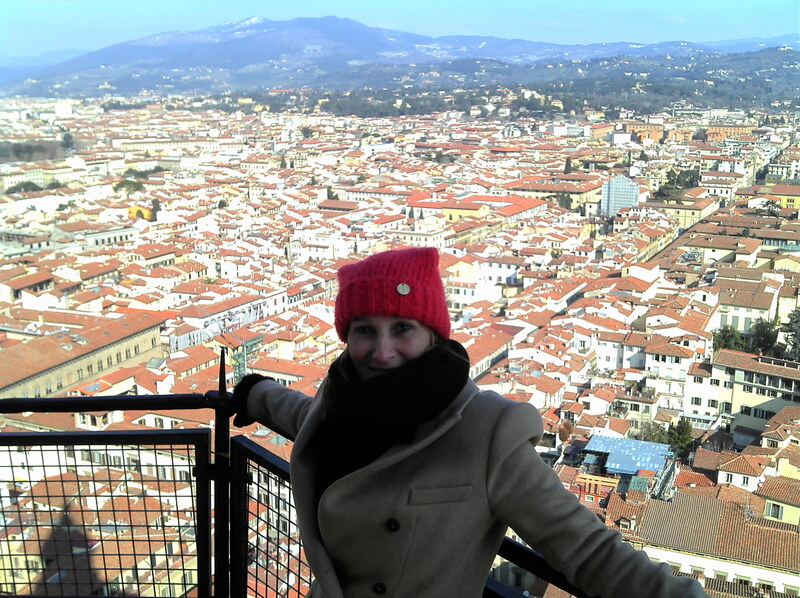 We were in Florence for 4 days and managed to explore it well. 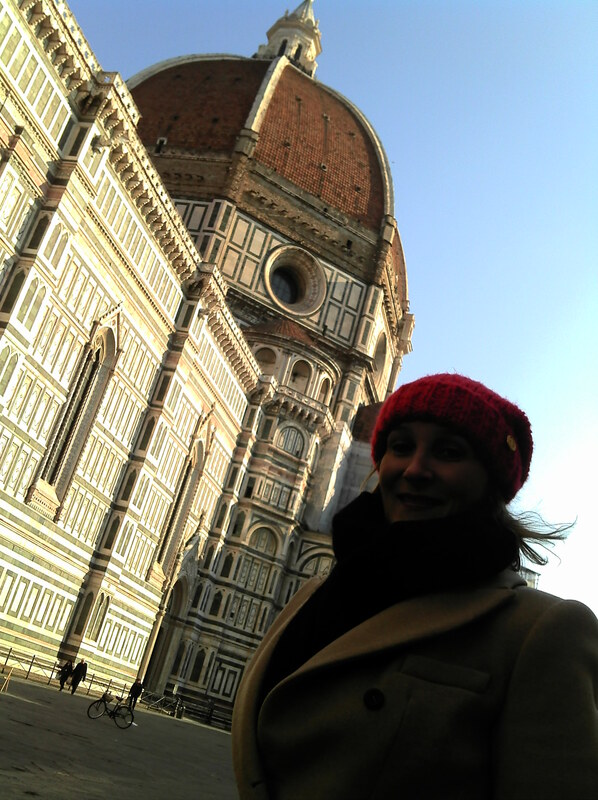 Florence in February is great: There are no QUEUES. 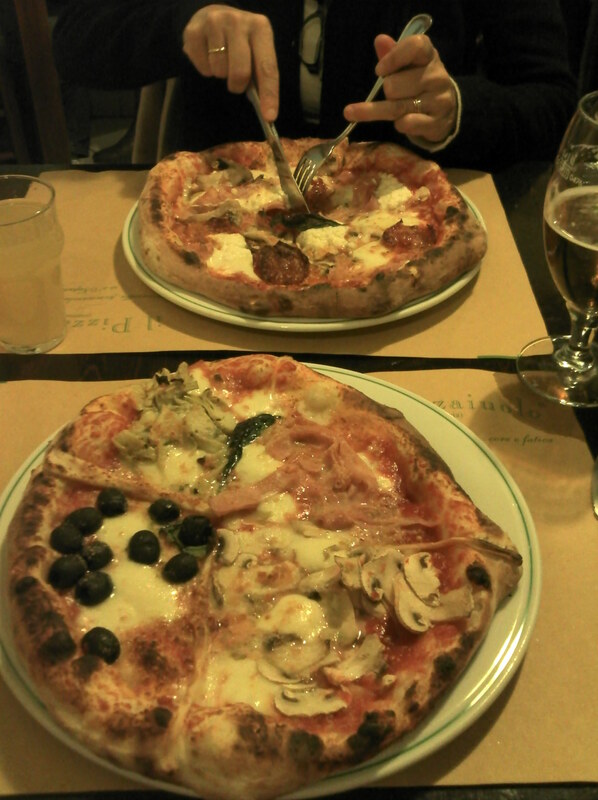 We had Florence for ourselves (well, almost). 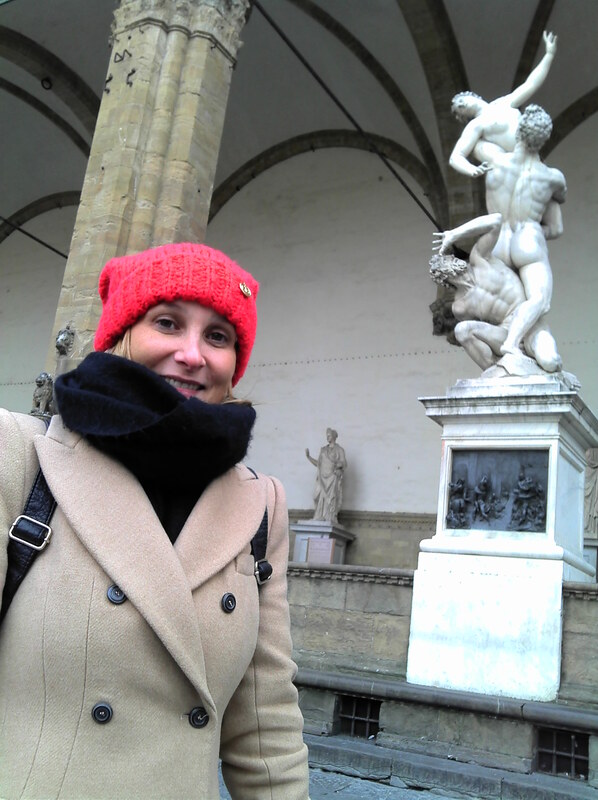 No queues at the Galleria degli Uffizi, one of the greatest art galleries in the world. In the summer you would be recommended to buy your ticket in advance and you might need to queue for about 2 hours before getting in. We could not even spot the entrance for few minutes, since there was no one there. We walked straight in and took our time to see it all and enjoy it at a very leisurely pace. Fantastic. Similarly at the Galleria dell Accademia, we walked in, and saw the magnificent Michelangelo’s “David”, from a distance with no crowds in the way, but also we were able to get very close and admire this amazing masterpiece, sculpted from a single block of marble, it is 4.1 metres high. The statue shows David in a contemplating pose, preparing for his fight with Goliath. 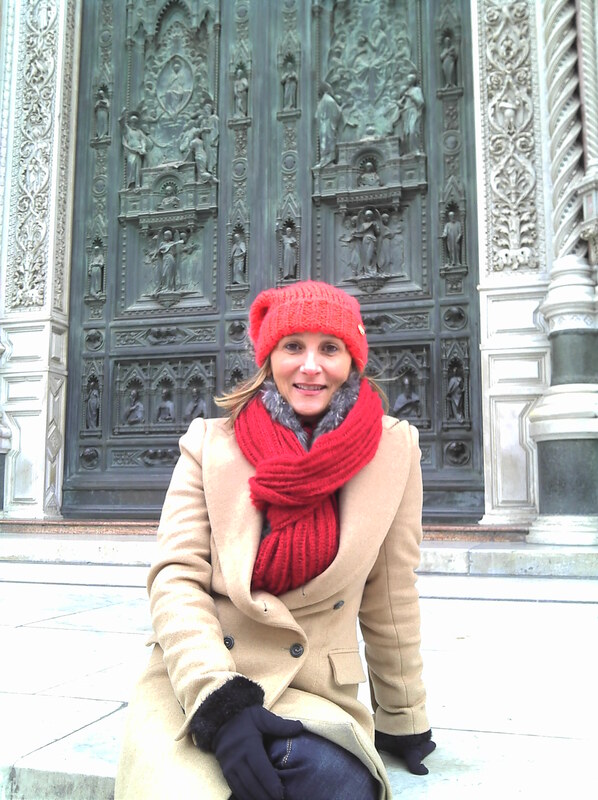 The Duomo, Campanille di Giotto and Battistero , is considered the greatest engineering feat of the Renaissance. Frescoes of the “Last Judgement”, decorate the interior of the dome, and you see it from a close proximity when you climb the narrow staircase to the top of the dome, the views from the top are spectacular and you can see the red Florentine roof tops from its summit. Great way of getting your bearings and to observe it all from above. We spent about 1/2 hour admiring the great views, it was a beautiful sunny day (again no queueing , the stair case is very narrow in places and it would be hard if needing to share a tight space with others). I am sure in the summer, they probably only allow few people at a time, to make it safer. 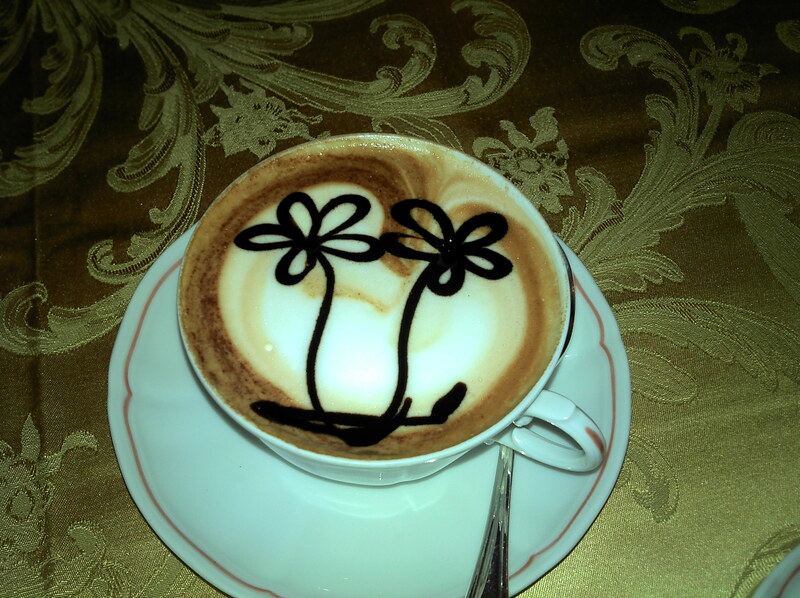 To stay warm, every so often we stopped for coffee and hot drinks, I had my best ever cappuccino in Florence. 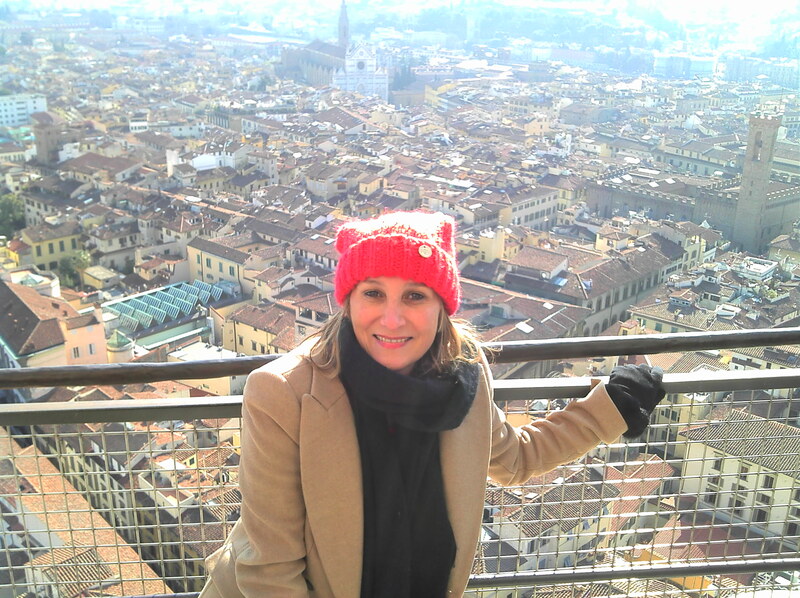 Eating and drinking in Florence is also a memorable event, the Tuscan cuisine does not disappoint and again it was easy to get a table at any of the lovely restaurants and there was not even a need to book it in advance. We enjoyed some very romantic meals there, including Brian’s birthday meal. 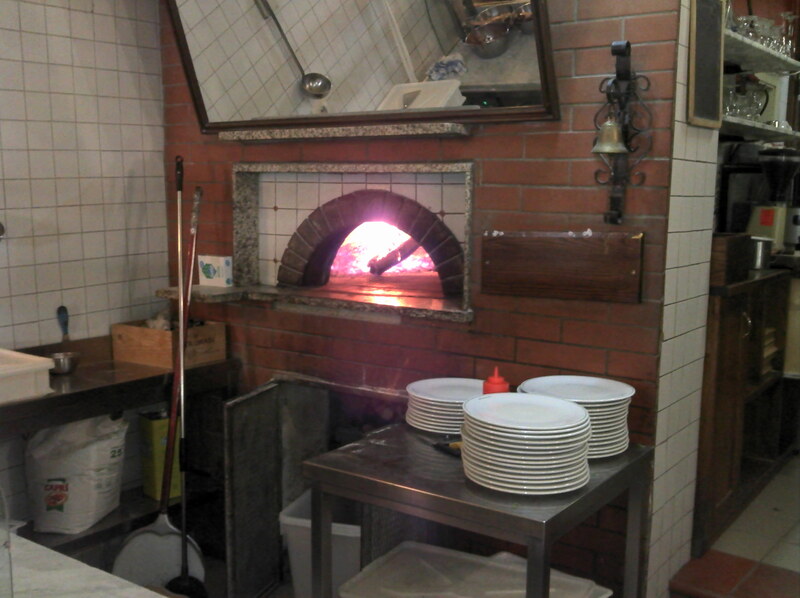 We found a great place to eat delicious pizza. 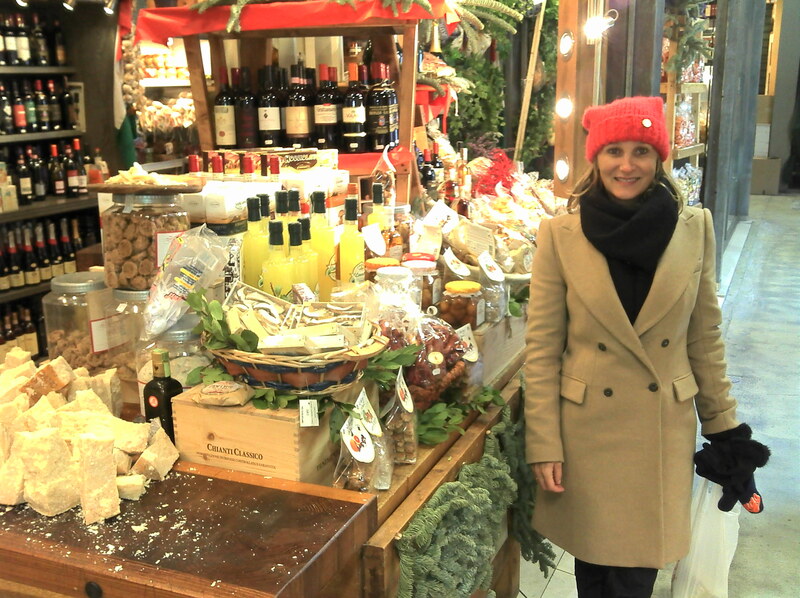 We also visited the Mercato Centrale, Florence amazing food market. Opened in 1874, it is a very large covered food hall ( the building is made of stone, iron and glass, designed by the architect Giuseppe Mengoni). Great displays of meat, cheese, ham, dried goods, gourmet foodstuffs and a selection of pasta that I have never seen before. 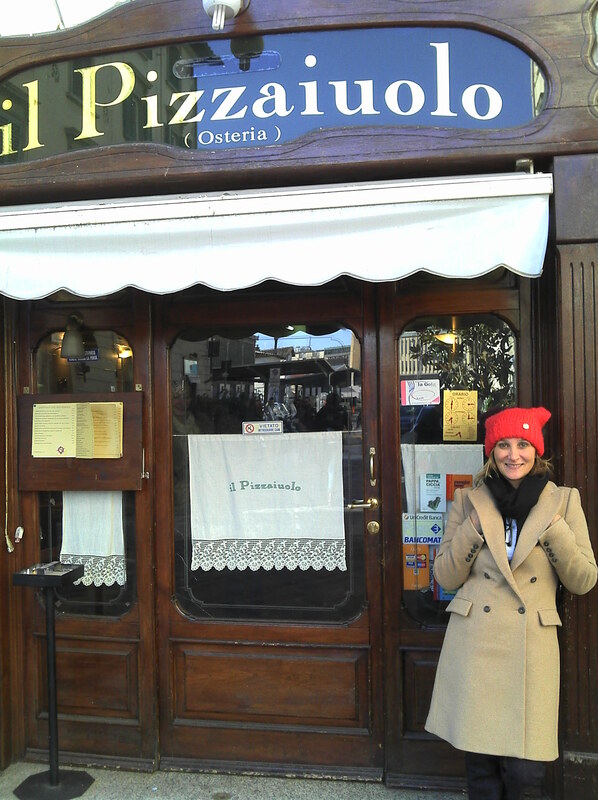 My main reason to visit this market was also to have “trippa alla florentine”, (tripe in a rich tomato sauce), a dish that my beloved late mother used to cook for us when I was a child and I love it. We bought it from a stall at the market and had it in a paninni. It was delicious and brought back comforting memories of my childhood. It is amazing how some foods and smells can be so evocative of the past. We also visited Santa Croce, a Gothic Franciscan church, inside it houses many tombs of illustrious Florentines. As you enter it on the right is the tomb of Michelangelo (although he died in Rome in 1564, he was buried here few days later). 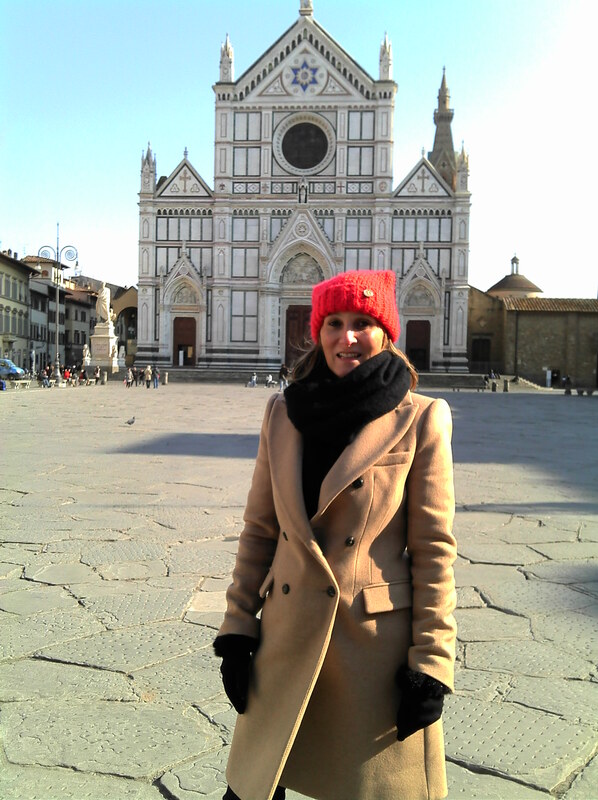 And, Santa Maria Novella, also a beautiful Gothic church, which contains some of Florence’s most important art works by Giotto, Brunelleschi , Lippi etc. And shopping (well, window shopping). 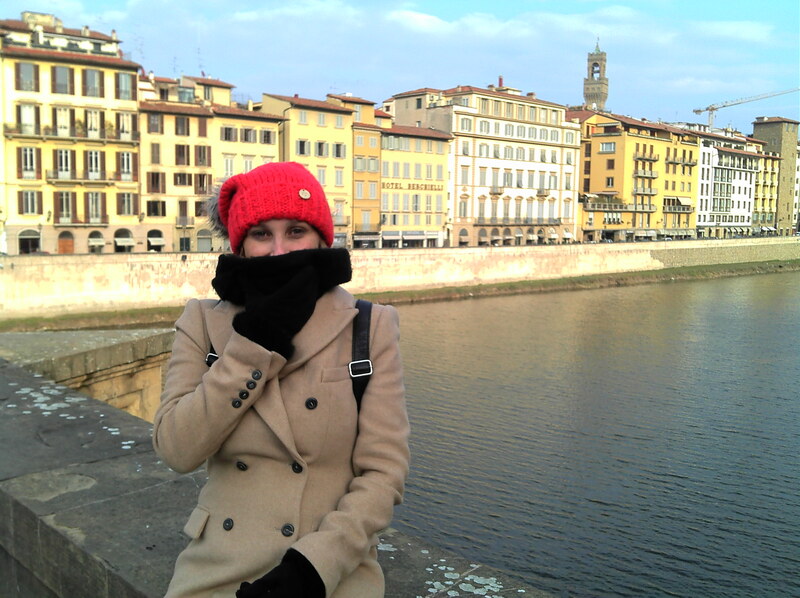 We loved Florence in February, but perhaps next time will try it in the spring or summer and walk around in much lighter clothing. Ahhhhhh… beautiful…..for sure, you look well wrapped up (and cosy) against the elements. 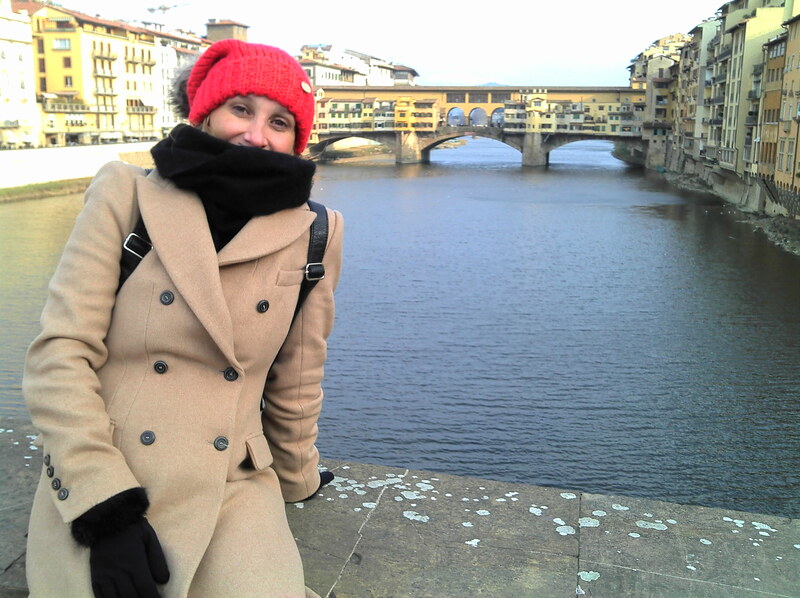 – reminds me of my own surprise birthday trip there, courtesy of my lovely husband – also in February (end of), so also cold, but lovely blue skies and sunny, and also staying in a hotel overlooking the Ponte Vecchio (good choice!) – but it sounds like we encountered a few more queues than you did at the galleries….! Couldn’t agree more re. 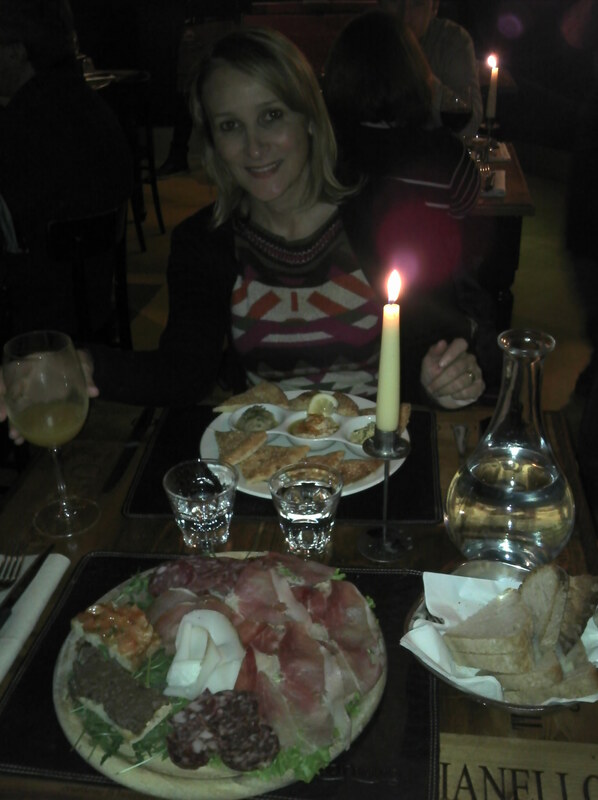 the food and drinks (coffees, and wine) – not to mention the ‘gelato’ – all delicious!! Looking forward to the next instalment. Sister me deu ainda mais vontade de conhecer a Italia…Belissimas fotos e me deu vontade de correr pra lá hj mesmo!